5.8.4 看板・表示編: ナショナルブランドの洗浄式トイレの注意書き - dutcheez’s Fun with English! When you sit on the seat, automatically the cold water flow. Wait for "off" the lamp to wash. When you sit on the seat, "STAND BY" lamp starts flashing. 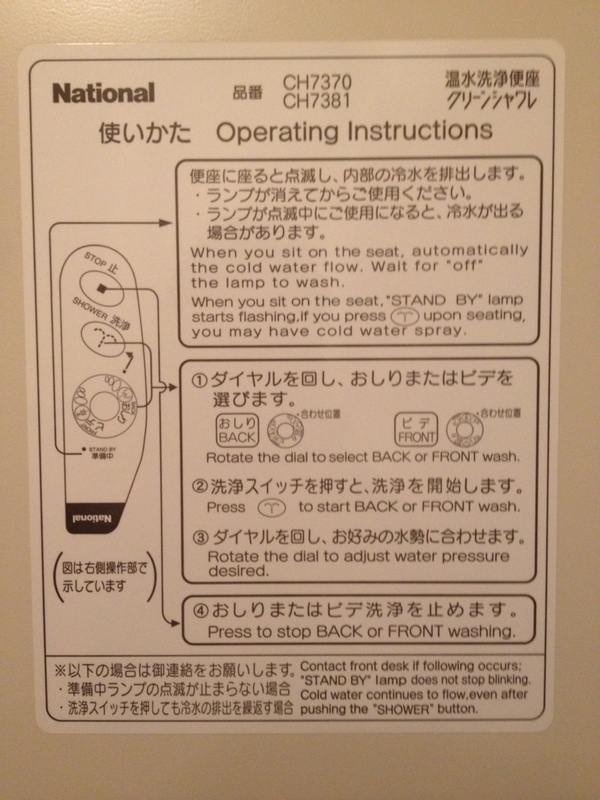 If you press ( けつボタン ) upon seating, you may have cold water spray. Rotate the dial to select BACK or FRONT wash.
Rotate the dial to adjust water pressure desired. Press to stop BACK or FRONT washing. "STAND BY" lamp does not stop blinking. Cold water continues to flow even after pushing the "SHOWER" button. Warm water is ready after the lamp stops flashing. Wait for the lamp to stop flashing. Warm water will be ready. Warm water is not ready when the lamp is blinking.